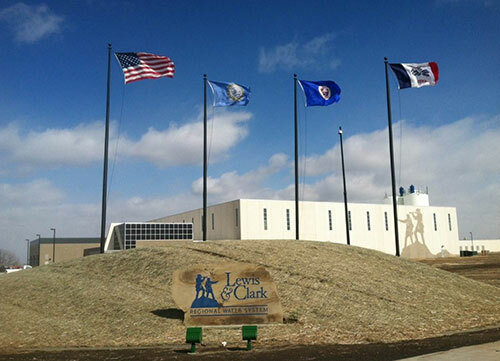 Lewis & Clark will eventually be a wholesale provider of high quality, dependable treated water to 20 member cities and rural water systems in southeast South Dakota, northwest Iowa and southwest Minnesota. An estimated 300,000 people will benefit in terms of improved quality of life and expanded economic development opportunities. Most members will use Lewis & Clark to supplement their existing water supply, while some will use it as their sole source of water. Through careful engineering analysis, the Missouri River was determined to be the most viable source of water for Lewis & Clark. The System utilizes a series of wells to tap into an aquifer adjacent to the Missouri River near Vermillion, SD. When completed the System will distribute treated water through 337 miles of pipeline to members in a roughly 5,000 square mile area — the size of Connecticut. In addition to a traditional lime softening treatment facility, the non-looped system also includes a series of wells, meter buildings, pump stations and storage facilities. The capacity of the completed system will be 45 million gallons per day (MGD), with the ability to expand to 60 MGD in the future. The 45 MGD represents less than 3/10th of 1% of the average daily flow of the Missouri River. After 23 years in the making, Lewis & Clark finally began delivering water to the first 11 members on July 30, 2012 and is currently serving 13 members.